As most parents, teachers, or camp staffs could tell you, one of the biggest differences when working with campers of different age groups is the amount of energy required. For example, I distinctly remember detesting rest time as a junior camper, but begged my counselors for more as a youth. In the Youth Peace Travel Team’s one and only week working with junior campers, we experienced these differences in energy output, and utilized it to the advantage of peacemaking. Camp Blue Diamond’s energy started right from Sunday night, where we learned the gem that is Gaga Ball, assigning chores became a lively game show, and our introduction rap got the loudest applause we’ve received all summer. 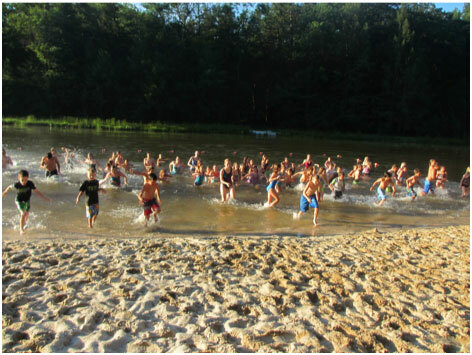 Our favorite sleep-depriving tradition started bright and early on Monday morning with an all-camp Polar Bear Swim (accompanied by song, of course). 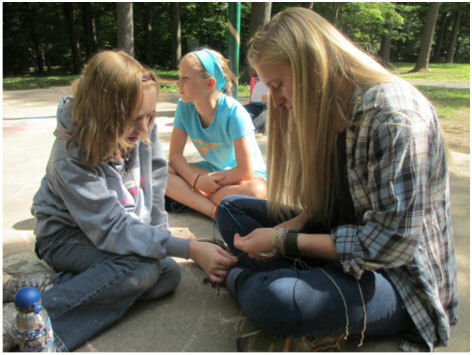 Christy and I tapped into our creative energy as we helped campers make heaps of friendship bracelets, and we used our energy of patience as our hair was yanked and twisted by campers each day at the “salon” (fateful picnic table). At a camp with a full-time counseling staff and over 60 campers, the level (and volume) of all activities was kicked up a notch, which brought us great exhaustion but mostly great smiles. As we were given one hour with each unit, we decided to revamp our interpersonal conflict session to present something that would be most relevant to junior campers and most matched to their energy level. Complete with motions to help remember our three highlighted conflict resolution strategies and improvised role plays, we were able to harness some of the energy of the campers and staff and direct it to the task of peacebuilding. One of the most rewarding aspects of this week was that we frequently heard buzz about “detriangling” and “I feel statements” throughout the week, and two units even decided to share what we had taught with the whole camp during skit night. It was so exciting to see and hear that they had really internalized our strategies. The rest of our time was spent hanging out with campers in their units, whether we were eating “darn goods” around the fire or taking a ride in the giant swing. I really enjoyed hiking to the Lost Lake with my new friend Skye, where we asked each other endless questions about our lives and understandings of peace. The team even had the chance to conquer the climbing tower with the junior high canoe camp and build fire with the senior high Outdoor Living Skills campers. No matter what we were doing, we were impressed by the constant enthusiasm of both campers and staff, and challenged ourselves to keep up. It was a joy to jump into the high energy culture of Camp Blue Diamond, and while they left us exhausted, they impressed us with their willingness to use their energy for earth-changing good. One of the most meaningful aspects of my Camp Blue Diamond experience came with the impact that our team was able to have with the campers. On the third day of the camp, the older canoe group came to us saying they had been having some conflict while out on the river and were having a hard time resolving it in constructive ways. We had a quick session with them to teach some conflict resolution strategies and just get to know the youth a bit more. After doing so, we heard from both the campers and counselors of the improvement in communication and overall cohesiveness of their group! I got to make a couple solid connections with some of the canoe-ers, even to the point where they wanted me to come stay in THEIR cabin. This made me excited that the youth were looking up to me as a role model and hopefully becoming better peacemakers in the process. The biggest take away from Camp Blue Diamond for me was how great of an impact a counseling staff can make onto a group of kids without even necessarily realizing it. I had the opportunity talk to a lot of campers both during meals and while just hanging out with them while playing games. There was one common theme that really stood out to me, the phrase, “I just really like (insert any counselor’s name), he/she is awesome!” Some of these counselors got praise for being funny, others for being really nice, but the most notable one for me were how many of them were said to make their campers feel accepted and loved. I can’t blame the campers for having such high praise for their counselors. At no point during the week did I see a counselor unwilling to be there for their kids. I was especially touched on Friday when the camp closed and campers started going home. 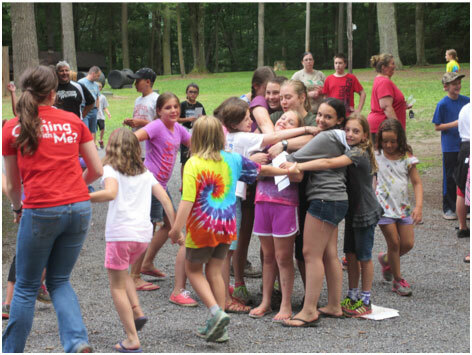 So many of the campers were hugging counselors over and over again, and a plethora of “Cinnamon Roll Hugs” coming from an all girls unit that had really bonded, it was clear to me how meaningful of a place Camp Blue Diamond is to both children and adults alike. I experienced the most energy from Camp Blue Diamond with the Junior High Canoe Camp on the climbing tower. The tower was a rock climbing wooden structure that utilized a zip line as its method of dismount. There were six different ways to climb up to the top each with their own particular challenges. Climbing was amazing, the perseverance and strength required to do any of the six different paths certainly taught the campers a lesson (that it takes hard work to reach a goal and sometimes you have to really push yourself). But what really struck me was the community exemplified in this activity. Ryan, one of the Outdoor Living Skills instructors, explained the do’s and don’t’s of the Tower, while Nathan and Sara took care of belaying the campers. At the end of the zip line were Karly and Gabe who aided people in detaching themselves from the zip line and making sure the line was clear. Each person communicated clearly what was occurring at their specific station to ensure that the next person knew what to do. Nathan would yell that someone was climbing and Ryan would acknowledge. Ryan would motion to Karly that the zip line was ready and Karly would signal to go ahead. Each of the staff members worked together to build a happy and safe environment for the campers. The interesting aspect of all this work was that this sense of community carried to other actions of the campers. In the dining hall each table was its own community, bringing in dishes and dishing out food to every member. Campers needed no encouragement to help and engage in the process of cleaning or of retrieving food for their body’s members. It truly impressed me how far reaching this sense of community was at Camp Blue Diamond. From the Jungle Breakfast to “Darn Goods” to camp bonds that hold true, there was a tightly woven and loving community here at Camp Blue Diamond.